Old Trafford in Greater Manchester hosted the final. The 2002–03 UEFA Champions League was the 11th season of UEFA's premier European club football tournament, the UEFA Champions League, since its rebranding in 1992, and the 48th European Cup tournament overall. The competition was won by Milan, who beat Juventus on penalties in the European Cup's first ever all-Italian final, to win their sixth European title, and its first in nine years. Manchester United's Ruud van Nistelrooy was again the top scorer, scoring 12 goals over the two group stages and knockout stage, in addition to two goals he had scored in the qualifying phase, although his side bowed out in the quarter-finals and missed out on the chance of playing in a final at their own stadium. Real Madrid were the defending champions, but were eliminated by Juventus in the semi-finals. A total of 72 teams participated in the 2002–03 Champions League, from 51 UEFA associations (Liechtenstein organises no domestic league competition). 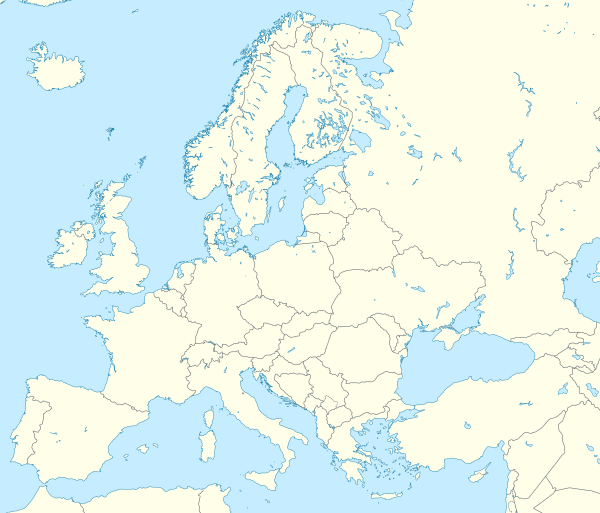 Countries are allocated places according to their 2002 UEFA league coefficient, which takes into account their performance in European competitions from 1996–97 to 2000–01. All draws held at UEFA headquarters in Nyon, Switzerland unless stated otherwise. 1Match played at GSP Stadium in Nicosia, Cyprus since UEFA banned international matches from being played in Israel. 1Match played in Sofia, Bulgaria after UEFA banned international matches from being played in Israel. Location of teams of the 2002–03 UEFA Champions League first group stage. 16 winners from the third qualifying round, 10 champions from countries ranked 1–10, and six second-placed teams from countries ranked 1–6 were drawn into eight groups of four teams each. The top two teams in each group advance to the Champions League second group stage, while the third-placed teams advance to round three of the UEFA Cup. Basel, Genk and Maccabi Haifa made their debut in the group stage. Maccabi Haifa became the first Israeli club to qualify for the group stage. The eight group winners and eight group runners-up were drawn into four groups, with each one containing two group winners and two group runners-up. The top two teams in each group advanced to the Champions League knockout stage. *Both clubs play in the same stadium (the San Siro), but Milan were the designated away side in the second leg, and so won on away goals. ^ "UEFA Country Ranking 2002". Retrieved 20 September 2010. ^ "UEFA access list for 2002/03 club competitions" (PDF). uefa.com. Union of European Football Associations. 21 December 2001. Retrieved 20 September 2010. ^ "Club competition draws and dates". 5 January 2002. Retrieved 20 September 2010. "Regulations of the UEFA Champions League 2002/03" (PDF). July 2002. Archived from the original (PDF) on 24 April 2003. Retrieved 1 July 2008.